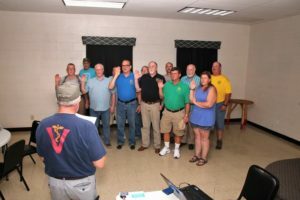 The officers and board members for the 2018-2019 term were sworn in at the August member’s dinner meeting. Pictured from left to right are Alex Wolf (board member), Mike Lane (board member), Tim Doxey (board member), Dean Matty (board member), Chris Ferguson (board member), Jimmy Fanny (board member), Jim Trommatter (treasurer), Gary Brown (board member), Ray Powell (president), Darden Langston (vice president), Ruth Debrito (secretary) and Allen Kiger (board member). The group was sworn in by Jim Ramsey. Jim was a guest at the meeting and is the president of the Norfolk-Chesapeake IWLA chapter.